Our recipe for creamy tomato soup is so easy you will wonder why you settled for canned soup for so long. I have included a bit of dried Italian seasoning as an option in this recipe, but you can simply leave it out if you want a more traditional homemade tomato bisque or soup. In a medium saucepan, combine the garlic, onion, and oil. Cook over medium-high heat for 1 or 2 minutes to soften and flavor the oil. Add the tomatoes with juice, broth and sugar and simmer for 10 minutes. Working in batches, purée the soup in a blender. Return to the pot and stir in the milk. Salt and pepper to taste. Add 2 teaspoons dried Italian seasoning for an Italian style tomato soup. Add it right at the beginning as you cook the garlic and onion. 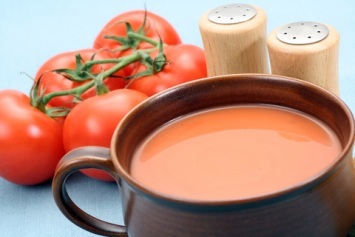 This is a delicious traditional tomato soup recipe or tomato bisque. You can use this as the base for a vegetable soup as well. Just add a few vegetables at the same time that you add the tomatoes to the pot. Cook for a bit longer if the vegetables need it. Add more garlic if you are a garlic lover. This recipe tastes wonderful with 3 or 4 cloves of garlic too. If you don’t like garlic feel free to leave it out. For a vegetarian soup, replace the chicken stock with vegetable stock or broth. As with most soup recipes, this one can easily be doubled if you need a larger batch. This is one of our healthy soup recipes. The garlic and tomatoes are actually both on our list of the 10 healthiest foods to eat. This soup is gluten free and also a wonderful diabetes recipe. It is fairly low in carbs and quite healthy. Omit the sugar for a diabetic recipe. Love tomato soup? Have a look at our Tomato Basil Soup Recipe. I went with the more garlic and Italian seasoning version. Quick and delicious. I always have vegetable broth at hand so it was made with that. I also added 1/2 tsp of baking soda to neutralize the acid in the tomatoes (my tummy is sensitive in that regard) … warning, it does colour the soup from a bright red/orange to more of a brick red/orange. And if you’re a soup fanatic like I am, forget the blender!! Invest in an immersion / stick blender. I take 1 cup of the soup out, blend the remainder in the pot and pour the cup back in. I do this because I like a bit of chunky — no baby puree for me. Maybe this is obvious to everyone else, but I would have appreciated a warning that putting too much in the blender at one time will cause pressure to build and it will blow the top off the blender when you turn it on, raining hot tomatoes down on the unsuspecting chef! Happy cooking! Just found your website on stumble and tried the tomato soup. 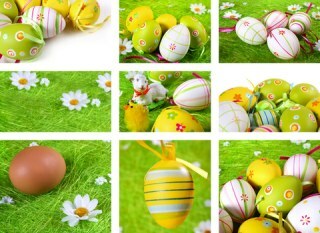 It was easy, fast and excellent! Looking forward to trying some more of your recipes.